New online orders or phone orders can be delivered to your home or business in the QC area for a special delivery charge. Please email or call us for details. If it has anything to do with a small engine, we can help you. 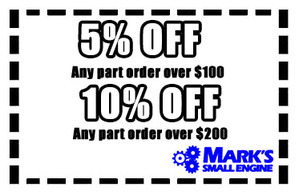 Mark's Small Engine provides new and used equipment, parts and service for your small engine needs. We also sell and repair engines from all the most trusted brands. Whether it's a simple repair, or a major replacement for your small engine, we have you covered. Be sure to check out our parts and service brands page to see all the brands we can work with. We work with the following small engines. From lawn and garden, to farm equipment, to sports vehicles like ATVs, we're sure if it has a small engine, we can help repair or replace it. If you're looking for a specific part, you can browse our large inventory. If it isn't here, we can order it and get it to you quickly. 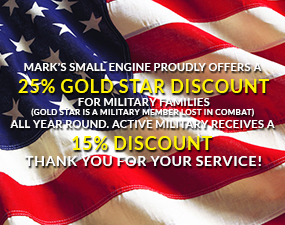 Our small engine service is second to none. We can take the pain out of fixing your problems. Pick up and delivery are available. 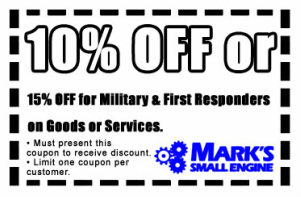 We also offer a 10% Military and First Responder Discount available! 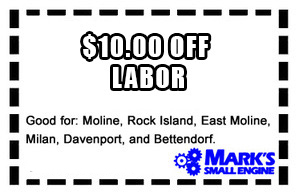 Call us today for more details: 309-794-9550. 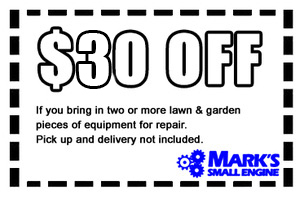 We also work on fixing your flat tires for tractors, mowers, and tillers. Bring in your flat and we can get you fixed up and back to work in no time. MTD,KOHLER/LCT. CHINESE ENGINES ARE A EXTRA $10.00 LABOR CHARGE, DUE TO LOWER QUALITY. USE STABIL IN YOUR GAS, IT CAUSES CARB DAMAGE. Mark's father started Dale's Cycle Shop in 1957. Mark grew up learning at his dad's shop and eventually took over in 2001. 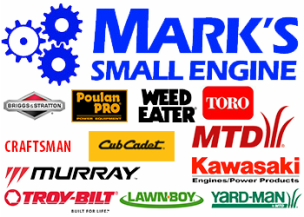 While keeping the business the same, he switched the name to Mark's Small Engine. With over 41 years of experience, Mark continues to do it the right way. 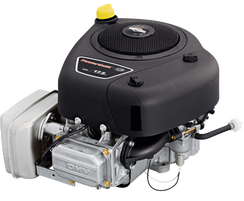 Briggs & Stratton Quantum Vertical Engine – 6.75 Ft-Lbs. of Torque, 7/8in. x 2 7/16in. Shaft. 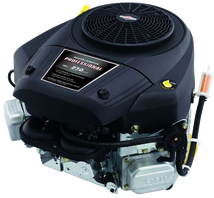 Briggs & Stratton Powerbuilt Vertical Replacement OHV Engine with Electric Start — 500cc, 1in. Dia. x 3 5/32in. L Shaft. 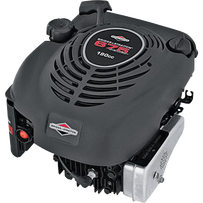 Briggs & Stratton Extended Life Professional Series V-Twin Engine with Electric Start — 27 HP, 1in. x 3 5/32in. Shaft.